They're beautiful and they hold up well. I love them. 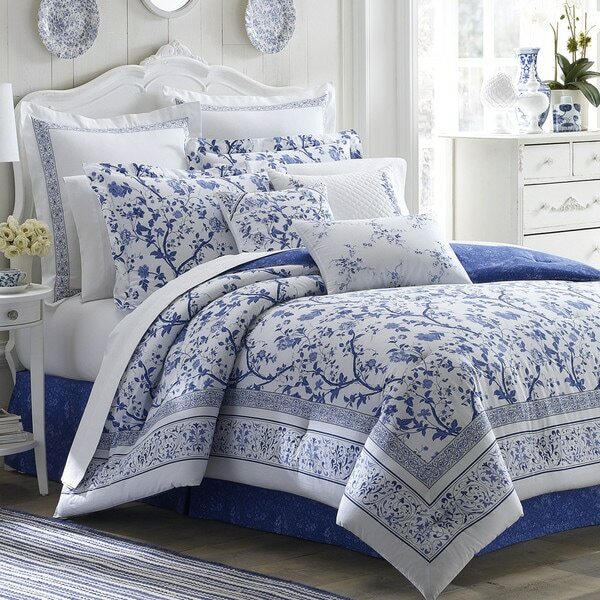 Evoking the timeless, soothing, blue and white porcelain floral pattern of eras past, this four-piece comforter set from Laura Ashley will inspire a calming ambiance in your space. With a hardy cotton shell and a polyester fill for all-season warmth, this set is machine washable for breezy maintenance. I loved the colors and the border. The fabric is soft and the comforter has good loft.It hangs approximately 10 inches on each side so definitely have to use the bed skirt. Over all I would purchase this again. Laura Ashley is a dependable product. The color is accurate, the white is a genuine white, not at all 'creamy'. I really like the bright crisp white and blue. It is surprisingly light in weight, though the filling is generous and promises a good winter weight on all but the chilliest of nights. I think everyone would like a quilt or comforter that is just 5 inches wider and longer than the standards, but the industry does not provide that except on high priced, specialty items. I can't justify that extra expense. This would be pretty with a white bedskirt, but I don't plan to do that with my room. Any standard white skirt, bought separately, would match the bright white in this comforter. Very pleased. I just ordered this group and have it on my bed, and it is beautiful. The color is bright and airy lookking. The comforter is of great quality and stretches across the bed perfect and doesn't slide around. I will use this for a long time. All my guests have loved it when they see it. From the photo I expected a large blue background with white design. However, the comforter is white with a blue design. It arrives very wrinkled, and the wrinkles do not disappear. Overall it has a nice look, but I believe it is overpriced for the quality. I have had a heavy thick comforter for many years but wanted something more light weight for the summer. This comforter is very lightweight and looks great on my bed. Since I was replacing the comforter, curtains, and shower curtain, Overstock is three for three. This comforter set is amazing. I remember when I was growing up, Laura Ashley was a very popular store, and I wondered where it went all these years. Finding Laura Ashley comforter sets at overstock.com has been a great find, because they are very fashionable, classy, they go with a lot of decor, and they truly bring out the girly feeling in everyone. For example, I bought this in order to be part of my guest room, however, I think that I might want it for my own room as well. I find that with these types of comforters, they can be interchange, as well as, with the pillows included, find themselves wonderful for any room, for any person to sleep in the bed. Furthermore, this comforter is incredibly comfortable, soft, as well as, not too hot. Along with this, I also bought a green one. The reviews for both are very similar, because they are both very comfortable and very fashionable at the same time. I'm very glad that Overstock carries Laura Ashley pieces, because it's very hard to find them anywhere else. The filling was so non-pliable, and it melted in the dryer. I threw it away. What a waste. The comforter is only 88" wide, 2" narrower than a standard size queen sheet. Why would Laura Ashley make it so your sheets show? It is very nice other than this significant flaw. 4" wider would make this so much nicer. I love this comforter set. It looks beautiful on my rice bed. It has been a long time since I have purchased any Laura Ashley Collections. The quality is the Laura Ashley I remember. The color and pattern is beautiful! I love the look of this comforter set and the color but the queen size is small. It would fit a full size bed but it is not long enough on the sides. Disappointing! Other purchases of the Laura Ashley brand have been of excellent quality. This set was skimpy, made of poor quality material. The dust ruffle was useless. I do love the colors. This comforter set is even more beautiful in person. The shades of blue are highlighted in the design that is difficult to capture in a photo. Enjoying my canine companion sharing a bed with me and drinking morning tea in bed, fabric that is forgiving with accidental stains is important. This bedding presents an eye catching, calming and stunning image when entering the room. Very happy! The comforter arrived yesterday. I couldn't wait to put it on our bed. It is absolutely beautiful! Best of all it is warm!!!! I'm very grateful for that because it can be chilly in the mountains where we live! The Laura Ashley comforter I purchased is simply gorgeous. The indigo blue just pops out against the white background. I have a Laura Ashley that is 16 years old, and it is in excellent shape. The new comforter is bright, crisp, and adds life to any room. The price was hard to beat, also. This comforter is amazing! This comforter is gorgeous in person. I have a lot a blue-and-white porcelain items that match it perfect. I believe it made my bedroom the showplace I wanted. I purchased two twin size comforters so there would be enough to hang down the sides of my king bed. These are very nice. They do have sizing in them and that makes me itchy, so I need to wash them. The color and pattern is nice and they arrived quickly. I loved the colors of this comforter and shams, but it's hard to tell from the picture whether that is actually what they look like. I was pleasantly suprised that it was just as beautiful when I received it. The ad said it was a 3-piece set, so I was assuming the comforter and 2 shams. I discovered that the set actually included a matching bed skirt. It is lightweight, but actually very warm. Would purchase similar again. Love the print. Shams could have been made of a little better fabric. Bed skirt is way too short. It does brighten and lighten a dark room and my present bed skirt matches the drapes. I could use both, maybe. Would , definitely buy the comforter. Love the crisp look of the deep blue against bright white...and while the fabric is similar to bedsheets, I think this enhances the crisp but delicate almost handkerchief-like feminine feeling of this bedding set. "Is it possible to purchase extra pillow shams in Charlotte? I’ve purchase the duvet set and wish to add two more shams." "What color are the pillow shams, are they the white ones in the picture or the blue flowered?" The shams that come with the set are the blue flowered shams. "What is the thread count and how thick is this? I am looking for it to be thicker than a quilt but not heavy like a regular comforter. Thanks." I was very impressed with the quality of this comforter, very thick and washes well. I love it! I will probably dry clean it the next time. I also bought the matching shower curtain. This is definitely thicker than a quilt is is a light weight comforter approximately 1 ½ inch thick fabric is t180 cotton. "I've seen the window balance, but not curtains. Can you purchase curtains too "
"is it thick and warm?" Yes, there are several great reviews stating that it can be lightweight or warmer comforter depending how it is layered. "What does the reverse side look like? How dark is the blue, compared with the front side?" The reverse side has a smaller white floral design, its pretty subtle. The blue is a medium shade, not overly dark and reversing it would still make this an ideal comforter for cooler months. The back side is a medium blue (not a true china blue - the shade is a bit more towards teal) with a delicate white design. It matches the dust ruffle. All in all, it's quite nice. The blue is a medium shade, not overly dark. It has a small, subtle white floral design. Reversing it would make this an ideal comforter for cooler months. The shade is the same as the lighter blue on the front of the comforter. I am a little linen obsessed and this is my favorite of any I have ever purchased. Its really beautiful. "do you have certain for it"